Last year former Microsoft programmer and congressional candidate Darcy Burner pitched a seemingly simple idea at Netroots Nation. The creation of a smartphone app that would allow shoppers to swipe barcodes to check whether conservative billionaire industrialists Charles and David Koch were behind a product on the shelves. But what Burner didn’t realize at the time is that a group of developers was hard at work on Buycott, an even more sophisticated version of the smartphone app she proposed. Buycott is the work of one Los Angeles-based 26-year-old freelance programmer, Ivan Pardo. 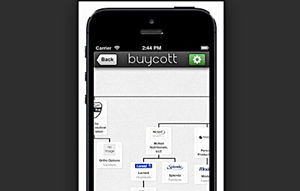 Once you’ve scanned an item, Buycott will show you its corporate family tree on your phone screen. Scan a box of Splenda sweetener, for instance, and you’ll see its parent, McNeil Nutritionals, is a subsidiary of LGBT friendly Johnson & Johnson. You can read more about the Buycott app and download it HERE. Shop for GOOD not EVIL. Thanks for the great tip. At the moment there seems to be a problem. I installed, uninstalled and re installed the app and it still does not work. The app seems to be very glitchy at this time. Hopefully it will improve.